Those who love wild nature and work toward a day when humankind might inhabit this abundant planet with greater wonder, humility, and compassion, mourn the loss of a great ecological visionary - Arne Naess - who died on January 12, leaving behind a legacy of environmental awareness and action. Naess, one of the most influential philosophers of his generation, died in his sleep at the age of 96 in Oslo, Norway. The avid mountaineer founded the Deep Ecology movement, drawing inspiration from Buddhism, Rachel Carson, Aldo Leopold, and above all from nature itself. Greenpeace can be proud that he served as the first chairman of Greenpeace Norway in 1988. His personal story illuminates the path of ecology in the 21st century. Naess was born in 1912, in Slemdal, near Oslo, and his father, banker Ragnar Naess, died the next year. Naess later recalled that his mother, Christine Dekke, appeared preoccupied with raising his two older brothers, so he often wandered alone into nature for companionship. In How My Philosophy Seemed to Develop he revealed, at the age of four, "I would stand or sit for hours … in shallow water on the coast, marvelling at the overwhelming diversity and richness of life in the sea." At the age of 17, while climbing on Norway's Hallingskarvet massif, he met a kind Norwegian judge, who also adored nature. This mentor advised young Arne to read Dutch Jewish philosopher Spinoza, who equated the 'highest virtue' with knowledge of nature. For Spinoza, Naess learned, all thinking about truth and human society begins with recognising the basic 'substance', the diversity and magnificence of the natural world. After graduation from the University of Oslo, Naess studied in Austria where he met the famous Vienna Circle of philosophers and psychoanalysts influenced by Sigmund Freud. Although inspired by the Vienna group, Naess found their philosophy too disembodied and intellectual. He pointed out that their understanding of the 'self' failed to include nature, and was therefore 'dead wrong'. Based on the notion from Spinoza that all being exists wholly in nature, he expanded the Freudian idea of 'self' and 'ego' to include our place in nature. Thus began one of the most influential traditions of modern ecology, Naess' development of 'Deep Ecology'. Naess returned to Norway, became Oslo University's youngest professor, and during World War II joined the Norwegian resistance, helping prevent the shipment of Norwegian students to German concentration camps. After the war, he led a UNESCO project to improve communication between the East and West by exploring how various cultures use similar words. The resulting report sold out, but UNESCO never reprinted it, according to Naess, "due to the politically dangerous character of its items." During the Cold War, listening to each other was not a high priority in Washington, Moscow, or London. In the meantime, by learning about Buddhism and Gandhi, and by reading Rachel Carson's Silent Spring, Naess realised that his love of nature had to be put into action if his ideas were to matter. In 1969, at the age of 57, he resigned his position at the University of Oslo and became active in environmental protection, "to live," he said, "rather than function." In 1970, he joined rural farming families near the town of Myvatn, Norway to stop a dam on the Laxá ('Salmon') River that threatened to flood their farms. This successful campaign, along with the Chipko movement in India, marks the beginning of environmental action that inspired the early Greenpeace movement. 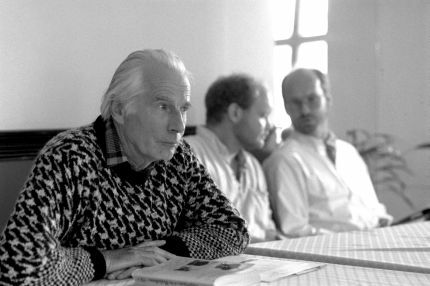 In the early 1970s, members of the nascent Greenpeace group in Vancouver, Canada began to hear about the Norwegian activist, Arne Naess, and his ideas about 'deep ecology'. As Greenpeace evolved from peace protests to full-fledged ecological action, Naess served as one of our inspirations. We agreed with his belief that other beings in nature - whales, seals, insects or trees - had their own 'intrinsic value'. We protected whales or seals not just to preserve the environment for human purposes, but for their own sake. This fundamental respect for nature became an important distinction in the environmental movement. I met Arne Naess in Los Angeles in the mid-1980s and later at a conference convened by Thomas Berry and Brian Swimme in Northern California. I discovered that the best way to engage him in conversation was to walk with him in whatever natural setting was close by. I recall his genuine sense of curiosity about species of trees, birds, or being engulfed in what he called 'the total-field' of nature. He never seemed intellectual, but rather spoke with a humourous, teasing quality that appeared to be always searching for some fresh, new understanding. He said his ideas were not 'philosophy' in the classic sense but rather 'intuition' gained from observation. We once pondered whether a particular sparrow was a 'Fox' or 'Song' sparrow, and I recall how he laughed that humans believe they understand something because they have named it. We talked about seeing an 'individual' in an animal, not simply a 'species'. In 1988, we felt honoured when Naess agreed to serve as the first chairman of Greenpeace Norway. Upon hearing of his passing, Greenpeace Nordic's Truls Gulowsen remarked, "Naess' ecological philosophy is still important to Greenpeace." So, what is that philosophy? Deep ecology starts with accepting the intrinsic value of all beings in nature and of the ecosystem itself. Naess challenged environmentalists to think beyond 'humans in nature' to recognise that the ecological system is not something separate that we are 'in'. Nature made us, made our eyes to see, made our limbs, tastes, and even our thoughts. He taught 'diversity and symbiosis', both in nature and in human ideas. A rich culture, he said, like nature finds stability in diversity and recognises how distinct parts and points of view serve the larger whole. This did not invite, he insisted, lazy thinking, but rather required precise language to express observations and experiences. Naess believed that humanity has no right to reduce the richness and diversity of nature except to meet vital needs of health and survival. He taught that our current impact on the world was excessive, perhaps obvious today, but a radical idea in the 1960s. He believed that the human population was too large, and that we should stabilise population growth and eventually allow human population to decrease. He believed this might take a century or more, but he believed humanity could eventually achieve a state in which our technology was non-invasive and "children could grow up in nature". "Then," he said, "we are back in the direction of paradise." Some environmentalists and human rights activists thought Naess's ideas were 'anti-human', but his compassion remained universal. "Appreciating a forest or mountain does not diminish anything humans do," he said. "We don't say that every living being has the same value as a human, but that it has an intrinsic value … it has a right to live and blossom." He challenged the common psychological notion that the 'self' develops from childish 'ego' to an adult social-awareness and finally to spiritual awareness. "Nature is left out of this formula," he noticed. "Humanism displays a certain arrogance, as if we are somehow separate or superior to nature." He believed that with enough attention to the world around us, "we cannot help but identify our self with all living beings; beautiful or ugly, big or small, sentient or not." He insisted that through this sort of maturity, we will discover that genuine quality of life has very little to do with consumption, wealth, and power. He summarised this in a proverb for living lightly on the earth, and which defined his life: "Simpler means, richer ends."